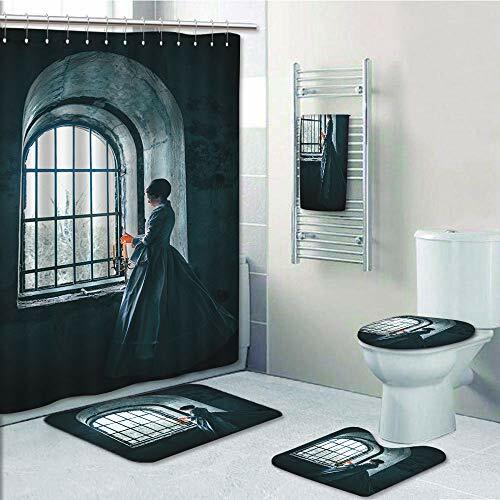 The set includes Size: Fabric Shower Curtain 72"W x 72"H(183 x 183 cm);31.5" x 63" bath towel(80 x 160 cm );23.62"W x 15.74"L(60cm x 40cm) Bath Mat,19.68"W x 15.74"L(50cm x 40cm)Contour Rug,13.77"W x 17.71"L(35cm x 45cm) Toilet Cover. MATERIAL: 1.Shower Curtain:100% polyester. 2.Mats and Rugs:100% microfiber polyester and Rubber Backing. 3.Bath Towel:100% polyester. 4.Shower Curtain Hooks:High-grade metal.